The global seafood supply chain is teeming with human rights abuses such as human trafficking, slavery, dangerous working conditions, and wage theft. In the United States, many seafood processing plants operate illegally violating basic labor laws. Bosses steal wages, don’t pay overtime, and force workers to work in dangerous conditions. Workers are not provided with adequate training or breaks. We are elevating worker justice and the voices of fish workers in conversations about just food systems and seafood supply chains. 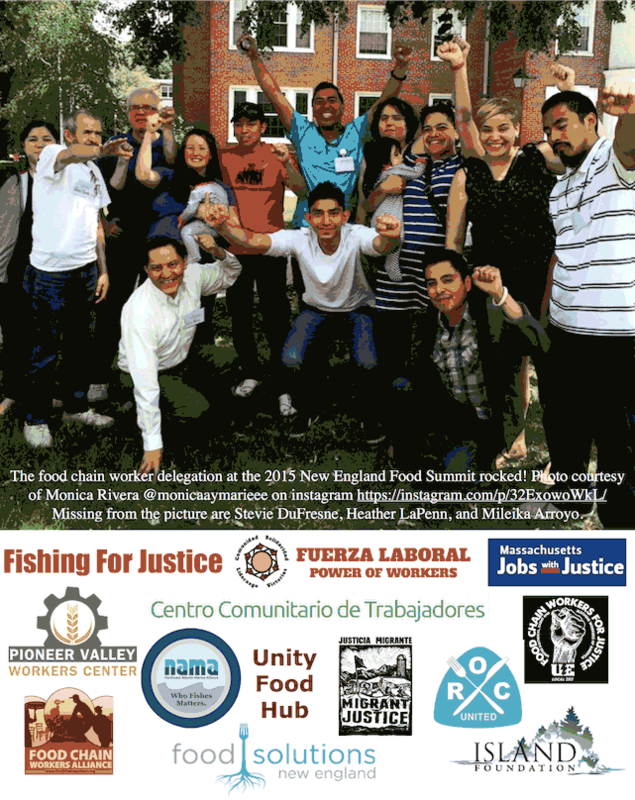 We collaborated with Migrant Justice to coordinate the first ever Food Chain Worker Delegation at Food Solutions New England’s 5th Annual Summit. Fishworkers from Pescando Justicia/Fishing for Justice joined food chain workers from across the food chain and New England to elevate worker justice in our food system. Pescando Justicia/Fishing for Justice is a coalition supporting seafood processing plant workers to organize. The coalition is anchored by the Centro Comunitario de Trabajadores (Worker Community Center) in New Bedford, MA.